Over the last two weeks, I’ve gone camping in Yosemite and had a friend visiting my home. It’s been busy, busy, busy. Later this week, I head to NYC then onto Virginia, rounding out a month of activity. I’m mostly holding up okay. I haven’t tried to do activities for this long without taking a serious rest break, at least not in the past eight years. I can tell I’m tired and running on my reserves. I’m hoping that I’ll somehow make it through. When I last blogged, I had just realized that my fatigue was a Babesia flare. Unfortunately, I didn’t have three open weeks to coil three times a day with two different frequencies. I did something else instead. I coiled three times a day at 753Hz for a few days. Then I coiled the whole body protocol (requiring the use of three coils) once a day, while also coiling for Bartonella once a day. I mixed it up and did part of the Babesia protocol in the morning and part in the evening, splitting the Bartonella protocol in half as well. I can’t say I’m for sure in remission. The symptoms disappeared. The fatigue hasn’t come back yet. On the hiking trip, my energy was pretty good. We did low-key activities for the first four days and went on hikes the last two days. I was able to keep up with the other folks on the trip. The hiking wore me out, but it did that to everyone. I had night sweats, but so did my companions because it was cold when we went to sleep in super warm sleeping bags, then warmed up overnight. So I’m not counting those night sweats as caused by Babesia. After the camping trip, I coiled for Babesia two days, then missed four days, then I’ll get to do it two more times before I leave for the trip east. I’ve had no herx at all, no headaches, no night sweats. I believe this will be enough as long as I don’t overdo my activities or provoke the infection with too much sugar. Getting enough restful sleep has been the biggest issue I’ve been facing. I wake up often at night. I sleep lightly. In order to stop this pattern, I need to have big naps for a few days in a row, and I need to coil for Bartonella aggressively for at least a week. Since that can’t happen, I’m doing my best to rest in bed and sleep as much as I can. I got into this mess when we were camping. I hate getting up to pee in the middle of the night when I’m camping. I have to find my headlamp, get dressed, leave the tent, walk across the campground, use the pit toilet, walk back (and stare at the millions of beautiful stars), find the hand sanitizer, get back in the tent, get undressed, and get back in my sleeping bag. By the time I’ve done all this, I’m wide awake and a little cold. Yet for the first three nights of camping, this is exactly what I did. It took me at least an hour to fall asleep again each night. My best shot at sleeping through the night was to stop drinking three hours before bed, stay up till 10:30, and go to the pit toilet right before I went to sleep. It helped if I lay down for awhile, maybe at 10, to trick my kidneys into thinking it was time to go crazy, which is what they usually do when I go to bed for the night. It worked. I was able to hold it until 5:45am. I woke up during the night, but I was able to put off getting up. The only problem with this scenario is that I couldn’t go back to sleep at 6am. However, it was fun to watch the early birds eating worms and other insects in the grass. I got to watch the sun come up over the mountains and the shadow of the mountains recede. The biggest problem was that my body went into overdrive. I couldn’t nap. I couldn’t settle down and be still, not even sitting. I felt like I needed something to do at all times because my mind was so restless. I reached a point of tired overdrive where I kept apologizing for everything (to the point that my companions were confused about what I was apologizing for). My brain had short-circuited. I managed to rest some when I got home. It wasn’t quite enough before another friend came to visit. We had lots of activities planned, all starting early in the morning. I feel the sleep deficit. I’m not sure if I can do anything about it. Sugar activates Lyme. There’s no way around it. Eating two bags of M&Ms is one way to get lots of sugar. That’s what I did on the drive back from Yosemite. The next morning I woke up with knee pain. It was excruciating. I got really worried. That day I did a full-body Lyme coiling session. Overnight, with 11 hours sleep, the pain was gone. I had some knee pain yesterday morning (over a week later) the day after a Lyme coiling session. I don’t know if it is a herx or if it is the kind of knee pain I get with Bartonella. I coiled for Bartonella yesterday. This morning, the pain was gone. Camping in Yosemite is fantastic. We actually stayed at Tioga Lake, near the park, and did day trips from there. I have a new camera from this past Christmas. I had a fabulous time taking photos of birds and flowers and scenery. The photos are posted here. 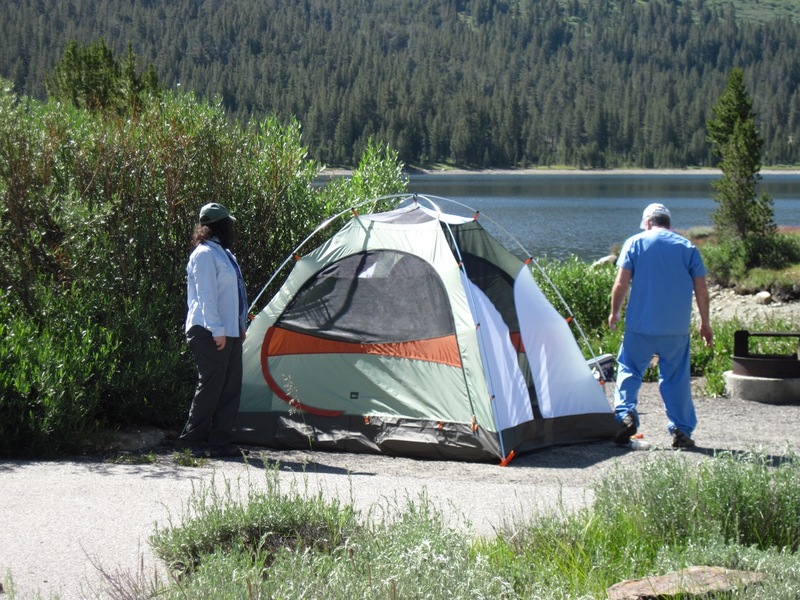 Setting up the tent at Tioga Lake with Joe. On the Friday of the trip, we hiked up to May Lake. I was tired from a shorter hike on flat land earlier in the day. I took my time, took pictures, and slowly made my way up the mountain. At the top, May Lake was beautiful. I was hot. The lake looked so tempting. As happened last year, I had no bathing suit with me. This time, my husband and I walked to the far side of the lake, away from where we were visible. He was hiking in his bathing suit. But I decided to go skinny dipping. It was a short refreshing dip in the freezing cold lake, followed by a few minutes drying off in the sun on some rocks. Fabulous. For quite a while afterwards, I couldn’t believe that I became that girl, the one who goes skinny dipping in broad daylight. It was fun to see myself that way, instead of the images of a woman struggling with her health that I’ve had for the past eight years. 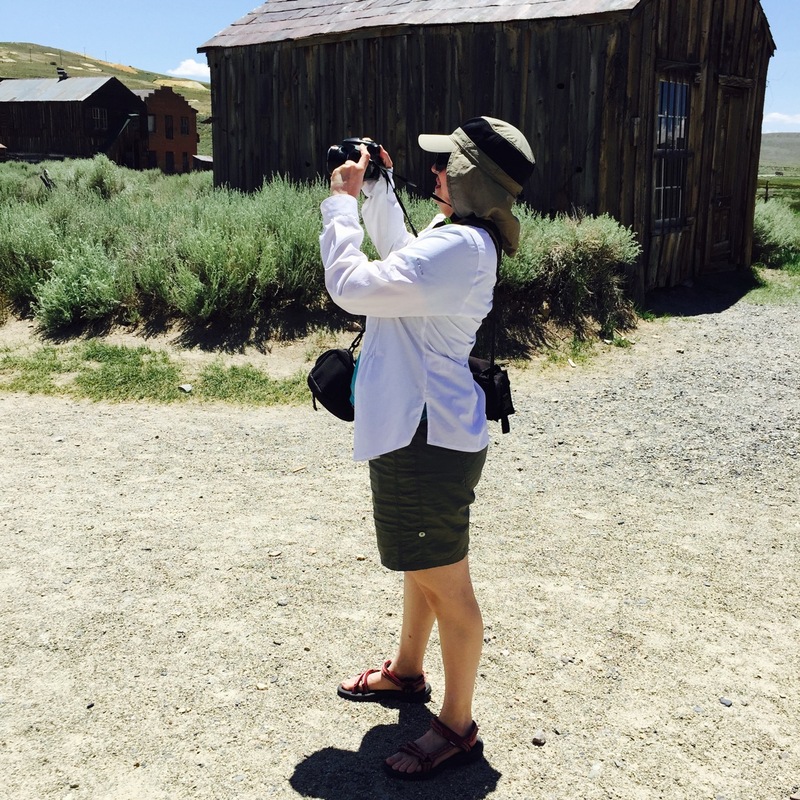 I took lots of photos, including some at Bodie, the abandoned mining town. 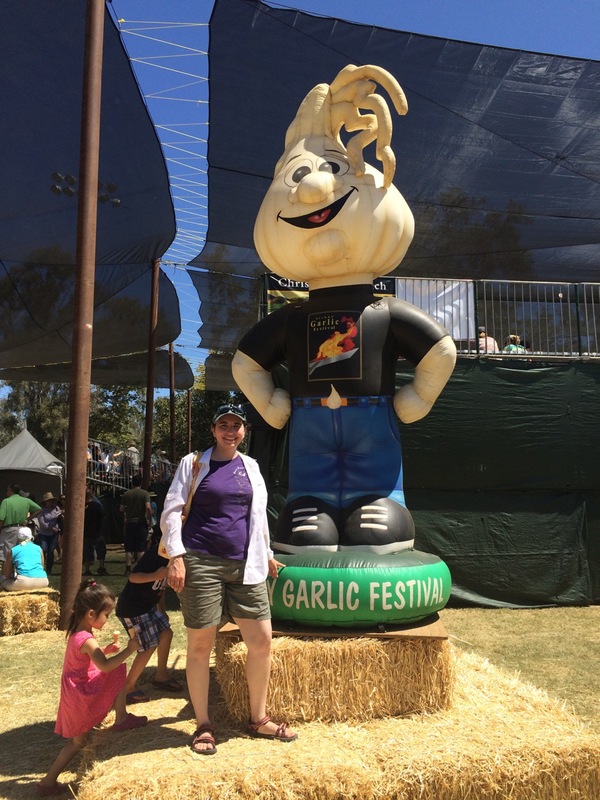 The other excitement when I came back was the Gilroy Garlic Festival. I wouldn’t even consider it when I moved to California. Now, after lots of coiling, and more coiling as I reintroduced various foods that used to trigger massive inflammation, I can eat garlic. That’s exactly what I did. Lots of it. After I was garlic saturated, my friend and I went to the arena where several celebrity and professional chefs were doing demonstrations. We watched a few chefs. In between each chef, while the stage was cleaned and prepped for the next one, an MC brought people up from the audience to show off their “talents” and win garlic and other food gifts. I sat through the jugglers, the Elmo impersonator, the teenager who did a split, the thumb-wrestler and a few others. Then I got it in my head to get on stage. I offered to recite a poem about a duck. This let the MC make a lot of comments about what rhymes with duck and what could be said at a family-friendly event. I recited Ogden Nash’s The Duck. It was silly. I got some applause and some pickled garlic. Mostly, though, I was that girl, the one who does embarrassing things and can laugh at herself. I feel like I’m starting to re-enter the world. In just over two weeks, I’ll return to California. I’m looking forward to coiling and making major progress. I really, really, really want to be well. It’s so close I can almost taste it (if I could get the taste of garlic out of my mouth…).